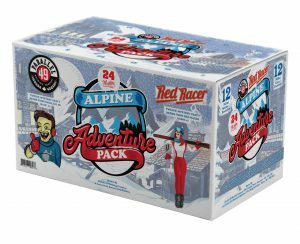 SURREY, BC – Red Racer and Parallel 49 Brewing collaborate once again on their new holiday mixer: The Alpine Adventure Pack. The winter collaboration between this popular pair of BC breweries is a winter tradition among beer enthusiasts across Canada. For the fifth annual release of this variety pack, Red Racer and Parallel 49 Brewing each created 12 beers to make this winter 24-pack special. Look inside to find creative new beers brewed just for the pack, as well as old favourites to help bring on the nostalgia. The Alpine Adventure Pack will hit liquor stores in BC, Alberta, Saskatchewan, and Manitoba starting the last week of October. By including multiple styles, flavours, and strengths of brews, Red Racer and Parallel 49 ensure there is a beer for everyone in the Alpine Adventure Pack! Like a traditional advent calendar, each date in the Alpine Adventure Pack reveals a new beer that is kept secret until the day it is opened. The pack is also an excellent way to try new beers, or to bring to your next winter party and be the talk of the season, long after the holidays are over! Craft beer fans will not be disappointed with 12 beers from each brewery in this winter mixer pack. What’s inside may remain a secret until you first crack the box-top, but eager fans will find plenty of styles, from session ales, to barrel aged beers, sours, and everything in between. Look out for Alpine Adventure Pack tap takeovers around Vancouver to join in the fun and help celebrate the launch of the Alpine Adventure Pack!